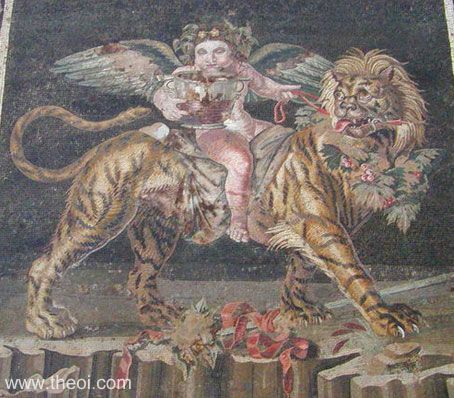 Eros (Roman Cupid), the god of love, rides on the back of a tiger. He is depicted as a winged infant crowned with a wreath of ivy and sipping wine from a drinking cup. The tiger is bedecked with a saddle, ribbon-like reins and a necklace of fruiting grapevines. Curiously the "tiger" has the mane of a lion.